If one of your resolution's is to lose weight and get in shape, you should extend that same pledge to your dog – especially considering obesity is the most common nutrition-related health problem for dogs. Just like humans, overweight dogs are at risk to develop chronic health problems, including arthritis, injury, heat stroke, complications during surgery and a shortened life span. Quality of life is another very important issue; if your pet becomes too heavy, he can have difficulty walking and may even struggle for breath. So before you take your dog on your daily jog, the first thing to do is talk to your veterinarian to make sure your dog is physically able to run for long distances, as some breeds are not built for this kind of activity. Secondly, it’s important that your dog is already fit and close to his ideal weight. View your dog from above. He should have an hourglass figure, with his waist thinner than his ribcage area. If you don’t see a narrowing behind his ribcage, he is carrying too much weight. Look at your dog from the side and look for a “tuck up” behind his ribcage at his waist. If his abdomen hangs down without any defined waistline, he is overweight. Feel your dog’s ribcage. You should be able to feel his ribs easily through your fingertips. If you feel a thick layer of fat over his ribs, he weighs more than he should. If you aren’t sure about your dog’s weight, take him to your veterinarian for an examination. Your vet can tell you once and for all if your dog needs to go on a diet. If your veterinarian determines that your dog is overweight and out of shape, it’s time to embark on a diet and exercise regimen. First, ask the veterinarian to give your dog a complete check up to make certain your pet is healthy enough to undergo a change in diet and adopt a new exercise routine. Your vet will most likely run a blood test, listen to your dog’s heart and lungs, and palpate his internal organs. Ask about a nutritional supplement for your dog. 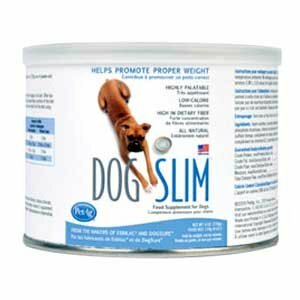 Feed your dog a weight-loss diet, recommended by your veterinarian. Your dog needs to get a jump-start on losing weight and a low-calorie prescription diet will set him on the right track. Start building your dog’s fitness level after he has lost some of his excess weight. If your dog is very heavy, he will need to take off a few pounds before you can safely increase his exercise. Make sure your dog can walk and breathe easily before you boost his exercise level. Plan a daily exercise routine for your dog. If your dog has been living a very sedate lifestyle, start slow with a walk around the block each day, gradually increasing the distance of your walks every week. Don't forget a collar and leash. Increase your playtime with your dog. If your pooch enjoys chasing a ball or retrieving sticks from a lake or the ocean, give him more opportunities to enjoy himself. The extra exercise will increase his fitness level and improve his mindset. Monitor your dog’s weight closely with the help of your veterinarian. Once your dog reaches his ideal weight, your vet will probably recommend changing your dog’s diet and/or quantity of food to help maintain his new, fit and trim self.